The thought occurred to me this morning that I never got around to doing a post on my stop in Lexington after I had visited parts of Concord a couple weekends ago. Truth be told, I still have posts to do of Baltimore, too, and that was how long ago? The end of July? Oy! Honestly, I need to start staying the heck home and editing the pictures I have rather than going out and constantly taking more - which is, of course, easier said than done it seems. Anyhow, because I'm still trying to catch up with things here at home off of the computer, I'm just going to make this a short pictorial post rather than one of my lengthy "wanna-be-a-history-teacher" posts. Plus I didn't really spend anywhere near as much time in Lexington as I could have and will no doubt go back again sometime so I can bore you with the history later - unless I get carried away here which is always a distinct possibility! 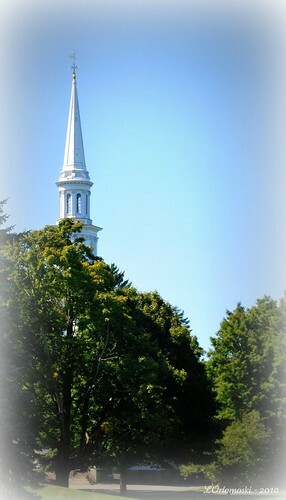 The beautiful church above, yet another quintessential white clapboard New England church, is the First Parish in Lexington which was constructed starting in 1847 following a fire that consumed the third meetinghouse for the Parish in 1846. 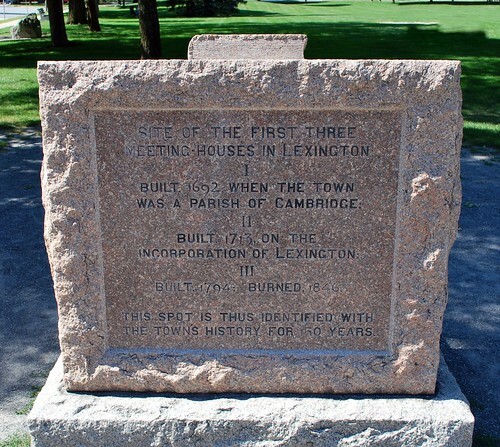 A marker stands on the edge of the Lexington Battle Green that indicates the spot where the first three meetinghouses were built beginning in 1692. 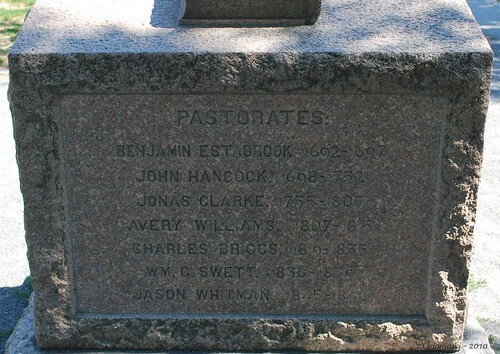 On the back of the marker is a list of the pastors who were called to serve as ministers for the Parish from the first pastor Benjamin Estabrook in 1692 to Jason Whitman who died in 1848 before the completion of the fourth and final meetinghouse. That second name isn't the John Hancock of American Revolution fame but obviously a close family relation as otherwise it would have made him really, really old when he signed the Declaration of Independence in 1776! "Love is the doctrine of this church. To seek the truth in love. Into harmony with the divine." Amen! And again I say amen! 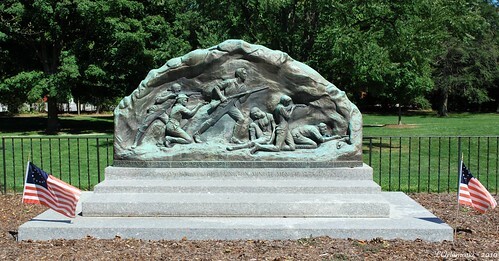 On the southeast edge of the Lexington Battle Green stands a statue that was errected in 1900 sculpted by Massachusetts artist Henry Hudson Kitson. It is often referred to as the Lexington Minute Man but that's not actually the case. The statue is that of Captain John Parker, a veteran of the French and Indian War, who was the commander of the Lexington Militia and, according to my research,: "Lexington is not known to have had ANY minutemen on hand on the 19th of April, 1775. According to testimony given by Lexington troop commander John Parker just after that date, he called his men militia, never minutemen. 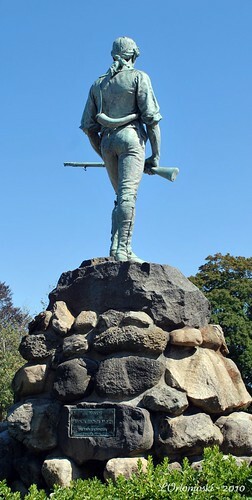 This statue's subject is a MILITIA member. 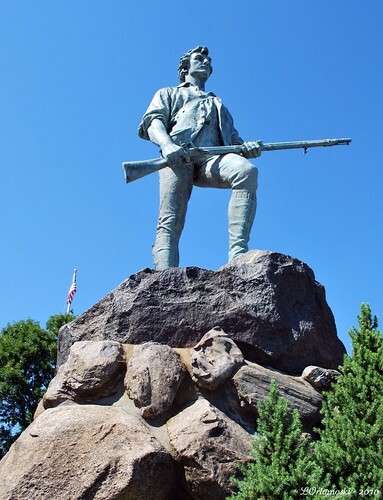 Nonetheless, locally, he is referred to as "The Lexington Minuteman" - a misnomer." Facing an insurmountable number, Captain Parker told his men instead to disperse and go home but because of the confusion, the yelling all around, and due to the raspiness of Parker's voice (he suffered from tuberculosis and was at times difficult to hear) some did not hear him, some left very slowly, and none laid down their arms. Even though both Parker and Pitcairn ordered their men to hold fire a shot was fired from an unknown source following which the British surged forward with bayonets ready in an undisciplined way provoking a few scattered shots from the militia. In response, the British troops - without orders - fired a devastating volley killing eight Massachusetts men and wounding ten while only one British soldier of the 10th Foot company was wounded. After order was restored the British Regular column was reformed and marched on toward Concord. To this day nobody with any significant certainty knows who fired the first shot of the American Revolution. Heck of a way to start a war, isn't it? 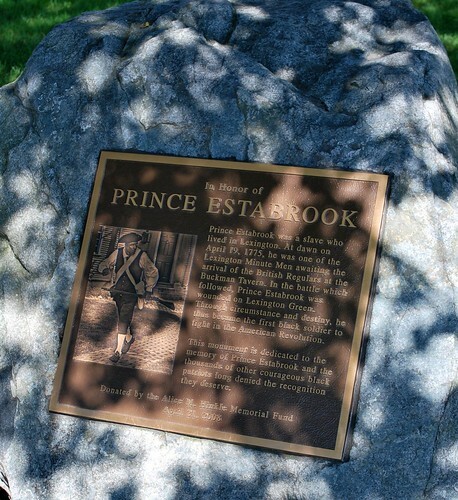 A memorial plaque dedicated in 2008 sits outside of Buckman Tavern to honor both Prince Estabrook, a slave who belonged to the Lexington Militia and became the first black soldier to fight and be wounded in the American Revolution, as well as "the thousands of other courageous black patriots long denied the recognition they deserve." Following his service to the Continental Army off and on until 1783, Prince Estabrook was granted emancipation by his master, Benjamin Estabrook. 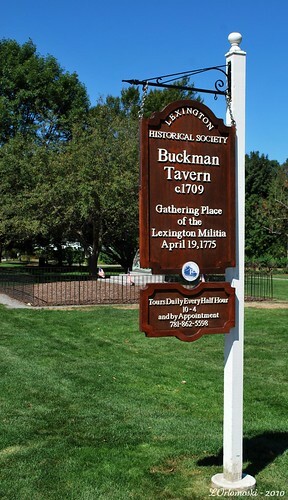 Buckman Tavern was the popular meeting place for Lexington's Militia to gather on days when they trained on the Lexington Green. The Tavern was built about 1690 and ,with a license granted in 1693, was the first Public House in Lexington. It was there that several dozen militiamen who had gathered on the town common went to await the British troops' arrival just before sunrise on the fateful morning of April 19th. Although best known as the headquarters of the militia, Buckman Tavern is also noteworthy as perhaps the busiest of Lexington's 18th century taverns. The tavern also housed the first village store in Lexington and in 1812 was also the first town post office. Declared a National Historic Landmark in 1961 and now operated as a museum by the Lexington Historical Society, the tavern's interior appears very much as it did in 1775. Among the many items on display is the old front door with its bullet hole possibly made by a British musket ball during the battle. As I said, I didn't get the chance to explore around Lexington too much as it was getting late in the day and I still needed to go pick up Jamie from her cousins' house but I do hope to get back up that way one of these days. 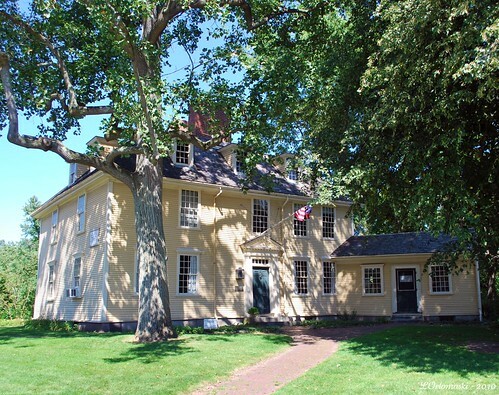 Perhaps then I'll have the time to tour the inside of Buckman Tavern as well as check out some of the other historical sites that Lexington has to offer. wow, that yellow building is stunning. I love old architecture. Looks like you went on a beautiful day too. Great post, Linda. You should have been a history teachers Linda. You would have been excellent in that profession. Just saying. The Buckman Tavern museum would be fun to tour. You certainly had beautiful weather for your visit. 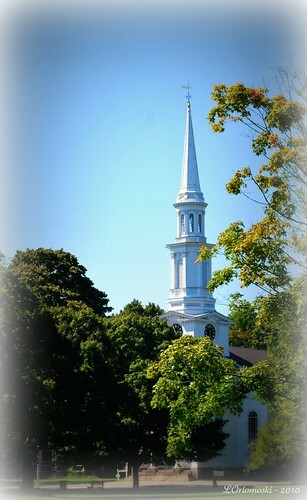 The churches in Lexington and Concord remind me of our church. I've said that before, I know. Except ours doesn't have a clock. That day was Severe clear. Just look at those blue skies! You couldn't have ordered up one better! That Tavern is just awesome! I'd love to see the inside of it! For a non-history post, this was very historical, just in case you didn't notice:) Another great job, my dear. I love your travel reporting. Your pictures are a real travelogue of information. Interesting information on the Battle of Lexington Green. Love the monuments and that church is pretty. love all the dappled shade pics!! here's something to make you drool...and you need to meet ellen b. anyways! Ben gave his slave a gun? sorry to be so late, my week got away from me a bit! this is a very interesting post! Don't stop going out and taking these wonderful pictures. Don't stop writing these outstanding essays about the history amongst which you live. Don't worry about how long it takes you to edit through photographs and put together these posts. OK? This is your hobby and you are so gracious to share it with us. So my last request is to enjoy it!